All library patrons may designate another individual (a "proxy") to request, pick up, and borrow material in the patron's name. For first-time or one-time proxy borrowing (picking up) of material, the proxy will need the patron's photo ID and a signed/dated note stating that [printed name of individual] is picking up [title of item(s) for you (full printed name)]. Please read the form carefully. Type your information into the form for printing. After printing, be sure to sign the form before submitting it. The form is not valid without a signature. Return the completed form to the Circulation Desk at the Kent Campus Main Library. You may also mail the form to: Library Circulation Desk, Kent State University, Kent OH 44242; or fax it to 330-672-3649, Attention: Proxy Borrowing, Circulation. For Kent State University-affiliated patrons, an email will be sent to your "@kent.edu" email address confirming the selection of a proxy; for non-Kent State University-affiliated patrons, a letter or email will be sent to the mailing or email address on file. Please allow 1-2 business days after the library receives the form for confirmation and for the proxy designation to be valid. For more information or questions regarding proxy borrowing, please contact the Circulation Desk at 330-672-7905. For first-time or one-time proxy borrowing of material, the proxy will need the patron's photo ID and a signed/dated note. After printing, be sure to sign the form before submitting it. The form is not valid without a signature. 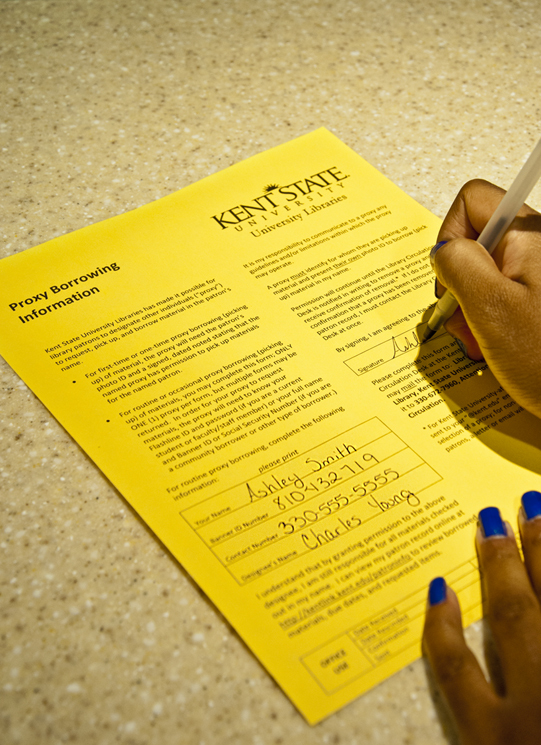 Return the completed form to the Circulation Desk at the Kent Campus Main Library. For Kent State University-affiliated patrons, an email will be sent to your "@kent.edu" email address confirming the selection of a proxy. For non-Kent State University-affiliated patrons, a letter or email will be sent to the mailing or email address on file.